Okay. 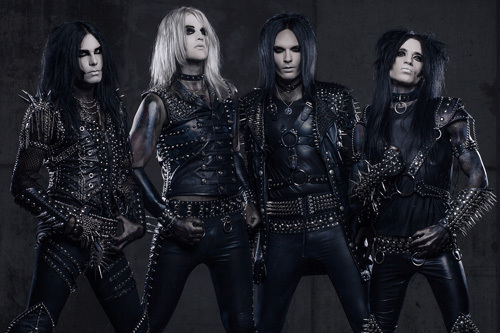 So you thought glam sleaze metal was dead and gone. You know, a bunch of skinny white dudes with corpse white painted faces, big moussed hair, and wearing spiked leather outfits. Well, you'd be wrong. Check out Sweden's Toxicrose and their first full-length album Total Tranquility. But the first and better question is, where have they been. They cut a five song EP in 2012 and then nothing. Fix, six years later the make their return. First, the band had the common sense not to include the songs, now four years old, from that first EP in this album. Total Tranquility boasts ten brand new tracks. Passing over the outrageous sleaze metal garb, it's sufficient to say that Toxicrose has a firm hold on their chosen genre. The start with the fundamentals like melody, harmony, and groove and then start adding strong riffs, a deep bottom end, fiery guitar solos, and catchy refrains making for some tasty melodic metal. Andy TXR's got a strong vocal presence, catching some of the gruffness and sneer from the punk side of sleaze metal's origins. As for the songs themselves, most every one is a straight forward rock monsters, rushing from the start with raging riffs. Sometimes there's moments of calm and steadiness like after the opening riffage of Clarity. Some light synths start the song Sinner, before the riffs come crashing down. They try to linger throughout the song but mostly get lost. Piano arrives at the start of the anthemic metal ballad Because Of You, only again to give way to the large guitar chords. 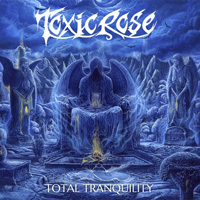 With the title track, Toxicrose takes a stab at a longer metal anthem featuring some more complex drumming, mixed tempos, and even a little acoustic guitar in the end. Overall, as said earlier, Toxicrose is on target with their melodic metal. Strip away the spiked leather and face paint pretense, and that's what Total Tranquility is: melodic heavy metal with a solid base in hard rock groove. And Toxicrose does it quite well. Recommended. Toxicrose is on target with their melodic metal. Strip away the spiked leather and face paint pretense, and that's what Total Tranquility is: melodic heavy metal with a solid base in hard rock groove. And Toxicrose does it quite well. Recommended.